African farmers have dug deep into their arsenals for tools to turn back elephants on midnight crop raids. Guns, firecrackers, spears, rocks and dogs join the fight. The farmers dig trenches, grow thorny hedges and, if they can afford them, electric fences. The methods have varying degrees of success. Electric fences and all-night patrols seem to be among the most effective, but the costs, in money or time, take a toll. Then along came beehive fences. “Our studies show that farms with beehive fences experience fewer crop raids and consequently have higher productivity than those farm areas which are unprotected. Thus, showing that the beehive fence is considerably more effective as a barrier than the traditional thorn-bush fences that most farmers use to keep out wildlife,” Dr. Lucy King, who heads the Human Elephant Coexistence Program at Save the Elephants and leads the Elephants and Bees Project, told E4C. Farmers found that lines of artificial beehives could deter most elephant raids, while honey sales added a new income stream. From as far north as Chad in Central Africa down to South Africa, Dr. King and her colleagues have conducted and compiled research on beehive fences. In dozens of studies throughout the continent, the researchers have tested hive styles, fence configurations, bee species, elephant species and other variables. Hive fences seem to work. “The conflict can be quite violent and injuries and deaths of elephants and farmers is not unheard of. So, the positive change in attitude to elephants that we have seen amongst the communities we are working with has been encouraging for the project and our work,” Dr. King says. The less conspicuous battle between farmers and elephants simmers on in a moral gray area. Human development has fragmented the elephants’ habitat and scattered their food sources, while farmers on the edges of wildlife reserves struggle to protect their livelihoods against opportunistic herds raiding their crops. Bees may be a solution that farmers can afford without harming the elephants. “Using bees has the potential to alleviate impending human-elephant conflict by peaceful means,” Dr. King says. In more than a dozen studies, Dr. King and her colleagues have experimented with beehive fences on East African farms, finding that the region’s indigenous bee, Apis mellifera scutellata, can turn elephants away. A notable long-term trial on farms outside of the Tsavo East National Park found that hive fences deterred 80 percent of elephant raiders compared to unfenced plots used as a control group. Tsavo is one of Kenya’s popular safari destinations, and its protected elephants know where to find concentrated sources of food in the bordering farmlands. To test the beehives, Dr. King and her colleagues placed hives around 10 plots of land, each .4 hectares (1 acre) in size. The researchers spaced hives by 10 meters (33 feet), alternating dummy hives between real ones to reduce the cost. Throughout the 3.5-year trial, from 2012 to 2015, the farmers and researchers placed 131 hives that produced 228 kilograms (503 pounds) of honey. There were 253 elephants that entered the farming community during the trial, and the 20 percent that managed to break through a hive fence were in smaller groups than those that commonly raided farms in the area. The researchers published their findings in 2017 in Conservation Biology with a free-to-read copy at elephantsandbees.com (PDF). The Great Elephant Census did not count forest elephants for a logistical reason: it’s hard to spot elephants in the woods from the air. An analysis of 80 surveys carried out on foot, the largest set of census data on forest elephants to date, found that their numbers had declined by 62 percent from 2002 to 2011. The causes listed include hunting and the encroachment of roads and other infrastructure into the elephants’ habitat. A debate once ensued over the classification of African elephants. The argument turned on whether the forest and savanna varieties were subspecies or different species altogether. But new research has found strong evidence that they are, in fact, different species. A comparison of the DNA of elephant species both living and extinct and found that the forest and savanna elephants are as genetically different from one another as Asian elephants are from extinct wooly mammoths. Fortunately for farmers, the bee and elephant feud extends across species. 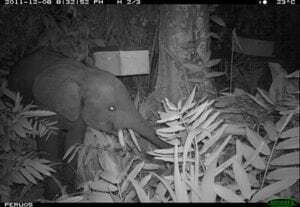 Forest elephants (Loxodonta cyclotis) in Central Africa appear to be as anxious about encounters with the Central African honeybee subspecies (Apis mellifera adansonii) as their savanna-roaming cousins (Loxodonta africana) are about East African bees (Apis mellifera scutellata). A team led by Dr. Steeve Ngama, a research associate at the Insitute of Agricultural and Forestry Research in Libreville, Gabon, that included a conservation biologist with the Smithsonian Institute and Belgian and American researchers, studied how beehives affect forest elephants around Gamba, a fishing town between two national parks in Gabon. The researchers singled out 10 mango trees, a popular fruit among the elephants, and they hung two hives from each of seven of the trees. They left the remaining three trees as controls. 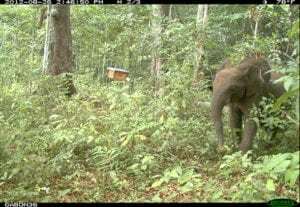 Motion-activated cameras that took still photos and video captured the behavior of both the elephants and the bees. 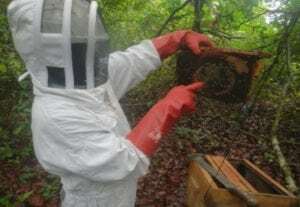 For 70 weeks, nearly a year and a half, the team recorded the spectacle, gathered honey and maintained the hives to keep them free of predators such as ants. Broadly, the findings were similar to those of the savanna elephant studies, that hives deter elephants, but not perfectly. The forest elephants tended to shy even from empty hives, but active hives were the best deterrent. The more active the bees in the hive, the greater the deterrent, the researchers found. But there is a trade-off between deterrence and honey production. Highly active bees produced less honey. “Beehives colonized by Apis mellifera adansonii bees can be effective elephant deterrents, but people must actively manage hives to maintain bee colonies at the optimum activity level,” Dr. Ngama and colleagues write. 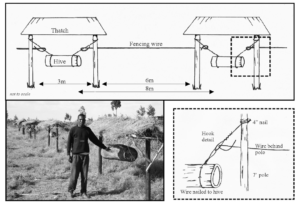 As a service to farmers, Dr. King wrote a how-to guide, now in its third edition, the Beehive Fence Construction Manual. 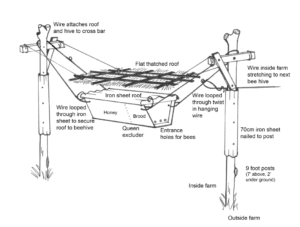 The manual guides fence-building using three popular hive designs. One is the Langstroth, the boxes filled with frames on which the bees build their honeycomb that are commonly seen in apiculture around the world. Another is the topbar hive, a horizontal trough containing slats or bars on which the bees hang their honeycomb. And the third is a regional variant, a log hive with closed ends and a hole in the center for harvesting honey. The Langstroth is easiest for harvesting with minimal disruption of the bees, but it is also the costliest. Fence styles vary, too. The construction guide covers traditional fence posts and biofences of living tree cuttings. The manual has been crucial for promoting beehive fences in Africa, Dr. King says. And her team’s surveys suggest that the idea is catching on. “The project is providing a sense of empowerment to these farmers and actually some of the older farmers in particular are just enjoying the hobby of being a beekeeper, too. They tell us in our surveys that they are ‘happy’ with being involved in the project and with having bees and this is a very important social attitude to support for those of us trying to help people live better with elephants,” Dr. King says. Hi there terrific website! Does running a blog similar to this require a lot of work? You may require buying a traveler to cover up your picture making apparatus. equipment, but you will need to take note of detail. image that are in focus. other users lіke its aided me. Good job. I stumbleupon every day. It will always be exciting to read through content from other authors and use a little something from their web sites.